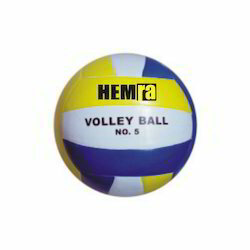 Being an eminent organization in the industry, we are intricate in manufacturing, exporting premium quality Volleyball Game Ball. We are engaged in manufacturing and exporting a wide range of Super Volley Plus to our esteemed clients. These are fabricated using best grade raw materials and acknowledged for the durability, reliability and high quality features. We offer our range of balls to our clients in various models and used in various organizations. These are available at economical prices in the market. We are successfully meeting the varied needs of our clients by offering a wide gamut of Colored Volleyball as per their precise needs. 32 Panel, Soft handstitched ball made from PU material, recommended for high level competition, shape guaranteed, in box packing. We provide premium quality stitched volleyball nets. Owing to its impeccable durability and strength, our range is widely appreciated by our clients. As the volleyball net is crafted to provide extensive tear resistance, it contains 3mm knot less braided nylon, a UV resistant heavy duty tape on top, bottom & sides with a plastic wire coating. 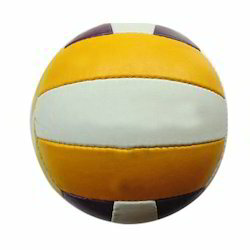 We procure best quality leather and rubber for manufacturing the range of Volley Ball Aviator Small that gives it tighter grip, smooth finish, and durability. Though, these raw material are purchased from reliable source, yet, we further check their quality based on different industrial parameters.